People love to communicate. It’s the reason most are attached to their mobile phone. Your MacBook also offers you options for messaging and keeps all things on one device: your MacBook! The first time you run Messages, you’re prompted to create an iMessage account by entering your Apple ID. You use your iMessage account to send and receive free messages to others using either a Mac or an iOS 5 device. If you’re already using AIM, Jabber, Yahoo!, or Google Talk and you want to use your existing IM account, open the Account Type pop-up menu and choose the correct type; then enter your existing account name and password instead. Alternatively, select the type of account you want and click the Get an Account button. Messages launches Safari and whisks you to the web page where you can sign up for that type of account. You can also choose to set up Bonjour messaging. Think of Bonjour as plug-and-play IM for your local network. In Messages, Bonjour allows you to see anyone on your local network without having to know his or her account information because Bonjour automatically announces all the Messages and iChat users who are available on your network. If you have others using Messages, Jabber, Yahoo!, or AIM on your local network, go for this option; if you’re not connected to a local network, however, Bonjour messaging isn’t necessary. Also, if you’re on a public Wi-Fi network or if you’re connecting to the Internet with an external modem through dial-up, disable Bonjour messaging. To turn on Bonjour messaging, choose Messages→Preferences, click the Accounts tab, click the Bonjour account to select it, and then select the Enable Bonjour Instant Messaging check box. After you finish these configuration necessities, Messages displays a window. Time for introductions all around! If you want to send an iMessage to other Mac owners, use the Messages window. In fact, if you already have an iPhone, iPod touch, or iPad running iOS 5 or later, you’ll probably immediately recognize the Conversation list on the left, which displays each individual with whom you’ve recently exchanged iMessages. Click an individual in the list to review past conversations. 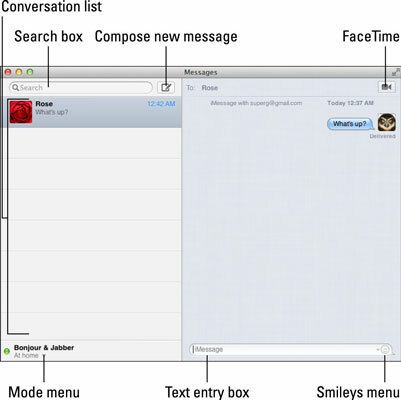 The right side of the Messages window contains the actual iMessages sent back and forth. If you’ve used iChat in previous versions of OS X, you may be lamenting the demise of your old friend, the buddies list; but don’t despair — it’s still around! You can display the familiar Buddies window at any time by pressing cmd+1 or by choosing Window→Buddies from the Messages menu bar. 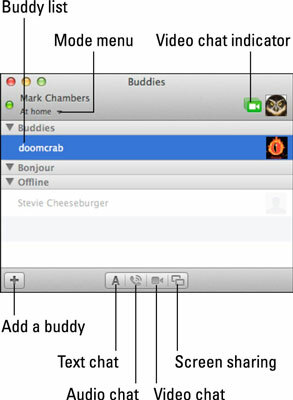 Use the Buddies window to invite others to chat using instant messaging. If you don’t like your picture, don’t panic. By default, Messages uses your user account thumbnail image as your visual persona. However, you can add a picture to Messages by dragging an image to the well next to your name at the top of the Buddies window. If necessary, Messages asks you to position and size the image so that it fits in the space. These buttons handle about 90 percent of the commands that you need to give while using Messages, so use ’em! Hey, look, there’s a Messages menu bar icon! When you’re running Messages, you can add a balloon menu bar icon in the upper-right corner of your screen. Click it to display the options. 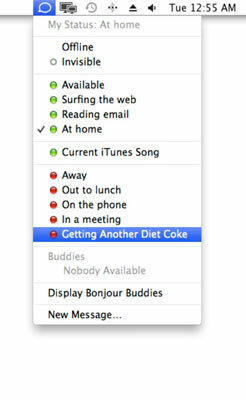 You can change your online/offline status, immediately invite a buddy for a chat, or display the buddy list. The menu bar icon appears only if you select the Show Status in Menu Bar check box. To find that check box, click Messages in the menu and choose Preferences; then click the General button in the Preference dialog. When you’re online, folks can invite you to chat and communicate with you. When you’re offline, you’re disconnected: Messages isn’t active, you can’t be paged, you can’t chat, and that is that. Your status applies only to IM and IM chat although not to iMessages, which can be sent or received at any time. Choose Available or Offline from the friendly Messages Finder menu bar icon. If the Messages window is visible, open the Mode pop-up menu at the lower left of the window. If the Buddies window is visible, open the Mode pop-up menu under your name at the upper left of the window. If the Buddies window is visible, you can also click a buddy name directly, which automatically switches Messages to online mode and starts a conversation with that buddy. You can use Away mode whenever Messages is running and you’re still online but not available. mode. Speaking of modes, you, too, can create a custom mode from either the Messages or the Buddies window: Open the Mode pop-up menu in either window, and then click Custom Available or Custom Away to create your new mode. An edit box appears, in which you can type the new mode; press Return to automatically add the newcomer to your mode list. To choose an existing mode, click it; modes with a green bullet are online modes, and red bullet modes are offline modes.